This month, Len’s Mill Store has the Bernat Colorama yarn on special — 100 g ball of 100% acrylic yarn for just $1.49 each. Next, I had to decide what I wanted to make with it. 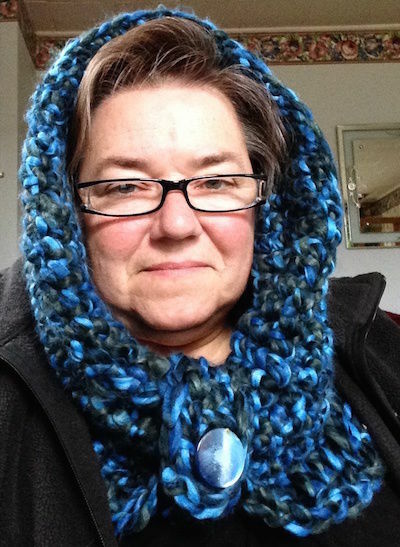 Well, I’ve been wanting a cuddly warm scarf that doubles as a hood for those blistery winter days and this yarn is SO soft and warm, it fit the bill perfectly. I began with a chain large enough to frame my face with some leeway for hair and getting on and off. I then did rows of single crochet until it was large enough to cover from the front of my forehead to the back of my neck. I added a row of “double crochet; chain one” to increase the scarf width so that it would sit across my shoulders and tuck inside my coat easily. Next, I wanted a little ring to hold the scarf together under my neck so that it wasn’t too big and bulky. I began with a chain large enough to wrap the scarf ( to the tightness of my liking) and I crocheted a row of single crochet around both sides, with three single crochets on each end. I found a big blue button in the stash of old buttons that I have from my Mother and attached it to one end. There is enough space in the stitches that they can easily be used as button holes. This also doubles as a bracelet if I want to remove it on those blustery days. It can go on my wrist and not get lost. The crochet hook: also purchased (on special) at Len’s Mill Store: 15mm. The yarn: 4 balls “Raging Sea” = approximately 200 yards. I have a bit left over still. and of course the labour is, what… $0.10 an hour? I added a photo with the hood down… forgot that one initially. it’s interesting that, on Facebook with my 3-d friends, this is the only creation that I’ve posted that hasn’t gotten “likes” and comments!